The horses have arrived, the speeches have been made, the dinners have been served, the wine has been drunk. Now all that’s left is the actual race. 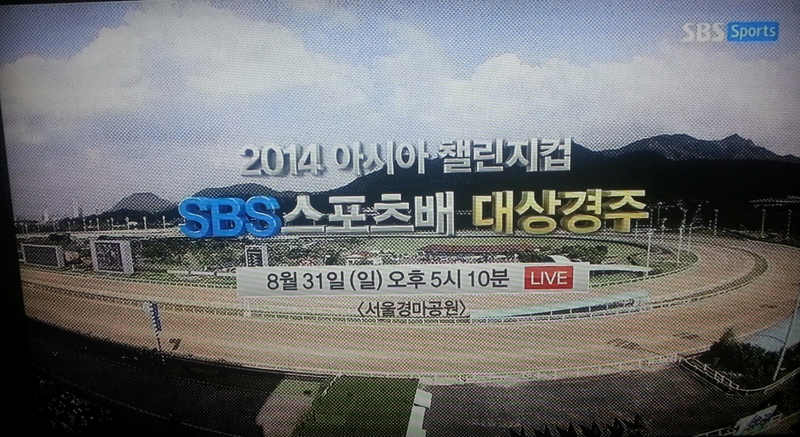 Later on Sunday, the SBS Asia Challenge Cup will finally go to post at Seoul Racecourse. And an extremely open race it is too. On paper, the three horses visiting from Singapore look too good. El Padrino, Trudeau and Speedy Cat all have ratings well in excess of 100 and are a class above the home team. However, the race isn’t being run on paper. More to the point, it’s not being run on turf or polytrack either, but on sand. Alien to the blue-blooded visitors, but totally natural to the Korean racers. Then there is the Japanese challenge. The NAR has great depth in its sprint ranks – arguably more so then the JRA – and while Chocolat Verrine, Pierre Tiger and Toshi Gang Star are no world beaters, they are all proven winners and will have few problems in Seoul’s sandpit. It’s a wide open contest and while class may eventually win out, it is set to be a great race. Unbeaten at this distance, however, this is a far stronger field than he’s ever faced before. Expect him to try to come from just off the pace, but it is going to be very difficult. A big chance with a perfect draw and Noel Callow, who has a 50% strike rate on this track, at the controls. He’ll try to close in the home straight and if he does it, expect Seoul to be drunk dry of wine by the end of the night. Likely to be outclassed here. By no means a bad horse, but doesn’t have the speed to compete in this company. Racked up another big race win earlier this month, how he takes to the sand is the big question. If he does, then he really should be winning. Perhaps the best of the Japanese visitors, certainly on recent form. Should come from just off the pace and has every chance. Perhaps the best hope for Korea. Absolutely belted Watts Village and Fly Top Queen last time out and unlike most Korean sprinters, he doesn’t need to lead from gate to wire to win. Veteran jockey Matoba won the SBS Cup last year on a relatively unfancied Japanese raider last year. Pierre Tiger should welcome the drop back in trip and could make it a double for Matoba. The least fancied of the Japanese trio, the grey is likely to be one of the front-runners but may have a hard time staying there. Overcame all the odds to record an incredible win for Korea in Tokyo last year but he’s going to have to overcome them again to win here. That 9-length defeat at the hands of Wonder Bolt was a bad one. One of two raiders from Busan and both have a chance. A really good filly with a lot of potential at any sprint distance, she should take to the Seoul track well. An extremely versatile filly, she’s yet another who has the potential to win this. Hasn’t really been herself on two visits to Busan in her last two races but back in Seoul, she should be back to her best. An unhelpful draw but there is plenty of time to overcome it before the turn. He’s not won this year but is a classy horse with classy jockey on board. The second of Busan’s entries and this one is just as good. Surprised everybody by grabbing 3rd in the Busan Metropolitan over 2000M, he should love the step back to his favoured sprint distance. Just like Watts Village, that defeat at the hands of Wonder Bolt dealt quite a blow to her reputation. As a result, she’s likely to start at the longest odds of her career. There’s never been a better time for her to put that right. Queen’s Blade becam the second filly is as many years to complete the Korean Derby and Korean Oaks double with a comfortable win in the fillies’ Classic at Busan on Sunday. Queen’s Blade and Kim Yong Geun win the Korean Oaks (KRA). Having run – and won – just once since winning the Derby at Seoul in May, Queen’s Blade was sent-off as the long odds-on favourite. She didn’t disappoint. Close to the front throughout, jockey Kim Young Geun eased Queen’s Blade away from the field in the final straight and they cruised to a 5-length victory. 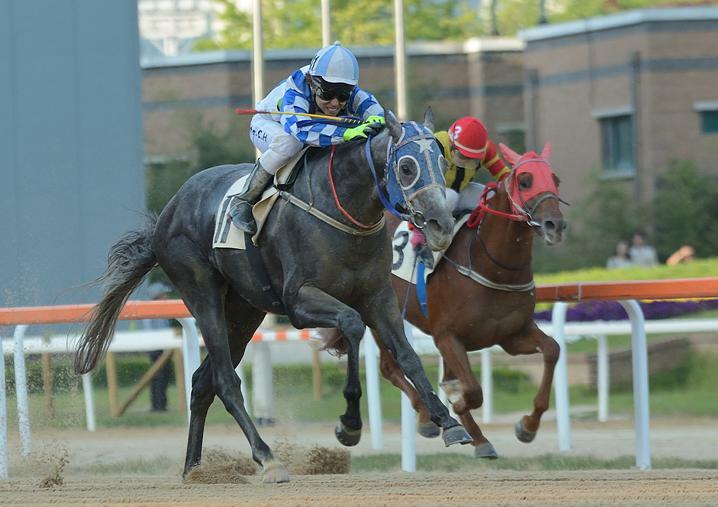 One of the Seoul raiders, Nubi Queen, grabbed second while Winner’s Marine was a further length back in third. It’s another Classic winner for Busan training machine Kim Young Kwan, following on from Speedy First, the filly who won last year’s Derby and Oaks. It’s to be hoped that Queen’s Blade doesn’t face the same fate as her predecessor. Speedy First only ran a couple more times and was last seen on the North East coast of the US. Next on the agenda for Queen’s Blade should be the final leg of the Triple Crown, the Minister’s Cup at Seoul in October. After last summer’s successful Korea/Japan Goodwill Cup, this year the race has been extended to runners from Singapore and on August 31, three Singaporean-trained horses and three from Japan will join eight from Korea in what will be the first ever International Invitational race to be run on the peninsula. The race will be shown live on TV in Korea on the SBS Sports Channel and there will also be a live simulcast to Singapore. The star attraction is set to be well-known Singapore based sprinter El Padrino but he will face tough competition from fellow Kranji runner Trudeau. For the home team, Watts Village, who pulled off a remarkable victory in Tokyo last November, will aim to repeat his heroics. He’ll be joined by Fly Top Queen and Wonder Bolt as well as Cowboy Son and New York Blue, who will be making the trip up from Busan. EL PADRINO (NZ) [Mr. Nancho – Crownie (Luskin Star)] 6-year-old Gelding (28/7/5/4) – One of Asia’s top Sprinters, El Padrino won the Merlion Cup, the first leg of Singapore’s Sprint Series, in March this year. He has also run and won in Dubai. He was 6th in the Krisflyer International Sprint in May this year and his Merlion victory earned him an invitation to the Golden Shaheen at this year’s Dubai World Cup. He didn’t go but he will be looking for international glory in Seoul instead. TRUDEAU (AUS) [Exceed And Excel – Canadian Legacy (Kris)] 7-year-old Gelding (33/7/5/9) – A surprise winner of the Garden City Trophy in Singapore last September, he followed that up with another victory a month later. He comes to Korea having won a Malaysian Group 1 race in June and with Noel “King” Callow, the winner of last year’s Seoul International Jockey Challenge, on board Trudeau could have a very good chance. SPEEDY CAT (NZ) [Scaredee Cat – Lane Cove (Magic Of Sydney)] 6-year-old gelding (35/8/7/5) – This very experienced horse has eight career wins to his name including two at this distance, one of which was last year’s Singapore Stewards’ Cup. Yet to win in 2014 but he has gone close and can’t be ruled out. CHOCOLAT VERRINE (JPN) [Gold Allure – Breezy Woods (Timber County)] 5-year-old Mare (24/6/5/3) – Runner-up in the Narashino Kirrato Sprint at Funabashi in July, Chocolat Verrine comes into this race in fine form, having finished outside the top two only once in five starts in 2014. TOSHI GANG STAR (JPN) [Kurofune – Pisa no Birkin (Sunday Silence)] 7-year-old Horse (46/4/6/0) – A vastly experienced horse, Toshi Gang Star has two big race wins to his name. He’s only run four times so far in 2014 with a 2nd place at Ohi his best result. Returning to the track for the first time in April, a change of scenery in Seoul could be just what he needs. PIERRE TIGER (JPN) [Cacoethes – Be Fragrant (Daitaku Helios)] 6-year-old Horse (38/13/5/4) – Recently back in action after a 5-month layoff, Pierre Tiger has two stakes wins among his thirteen career victories to date. His biggest win came in the 2012 Mile Grand Prix at Ohi. His best performance in three runs this year was a 3rd place finish over a mile at Kawasaki. WATTS VILLAGE (USA) [Forestry – Edey’s Village (Silver Deputy)] 4-year-old Colt (14/6/4) – Secured his place in Korean racing history by being the first Korean-trained horse to win overseas when he won the Interaction Cup at Ohi Racecourse in Tokyo last November. He was 2nd in this race last year. Recently returned after a six-month layoff, finishing 2nd behind Wonder Bolt in his first race back and should improve. FLY TOP QUEEN (USA) [Henny Hughes – Cape Discovery (Cape Town)] 4-year-old Filly (9/6/1/1) – The most expensive racehorse ever imported to Korea, Fly Top Queen has won 6 of her 9 starts to date including the Segye Ilbo Cup this February. A very quick sprinter, she had an off-day in her last start, finishing 3rd behind Wonder Bolt and Watts Village. She can run much better than that. WONDER BOLT (USA) [Desert Warrior – Little Champ (Great Gladiator)] 4-year-old Colt (19/5/7/1) – Currently the hottest sprinter in Seoul following his 9-length demolition of Watts Village and Fly Top Queen in mid-July. Very experienced and versatile – he was 5th in last year’s Grand Prix Stakes; he comes into this race in the form of his life. PERSIA WANGJA (CAN) [Ghostzapper – Dynamite Dancer (Lite The Fuse)] 3-year-old Colt (10/5/1/1) – Has won his last two races, both of them at this distance and looks ready to challenge some of the more established sprinters. Like Wonder Bolt, he can run at any distance but 1400 metres is his best. CHANGIPARANG (USA) [Touch Gold – Victory Roll (Deerhound)] 5-year-old Mare (27/2/5/3) – A reliable mare with a lot of experience under her belt but only two wins. She regularly picks up prize money but she will be a big outsider to do so here. BICHUI JEONGSANG (USA) [Wildcat Heir – Persimmon Honey (Colonial Affair)] 3-year-old filly (6/4/2/0) – Lightly raced, Bichui Jeongsang has won four of her six starts to date including a comfortable victory in the JRA Trophy in May. 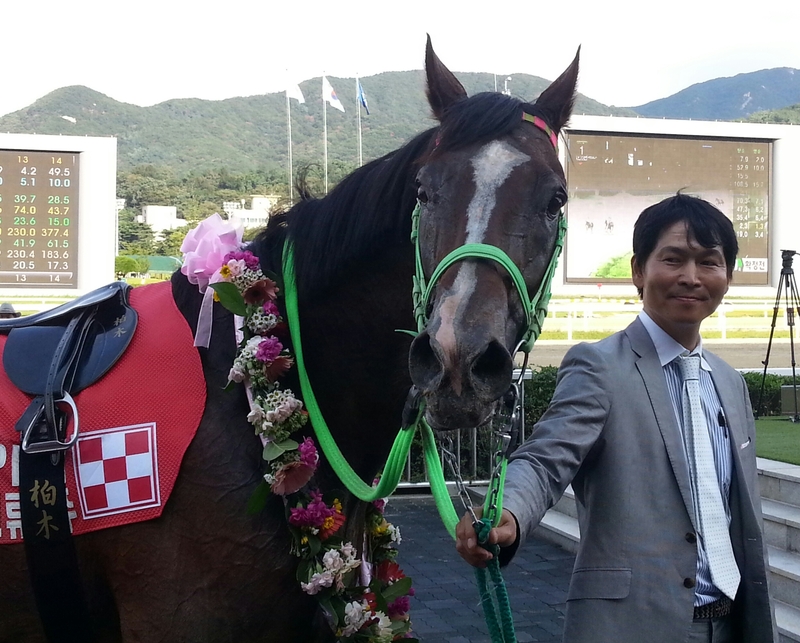 She was second on her last start in June but remains one of Seoul’s most promising fillies. COWBOY SON (USA) [Cowboy Cal – Nosmallachievement (Smart Strike)] (11/8/1/2) 3-year-old colt – Having finished third in the Busan Mayor’s Trophy in July, Cowboy Son drops back to his favored sprint distance for his first visit to Seoul. He is his sire’s highest earner anyway in the world and one of the most formidable sprinters in Korea. 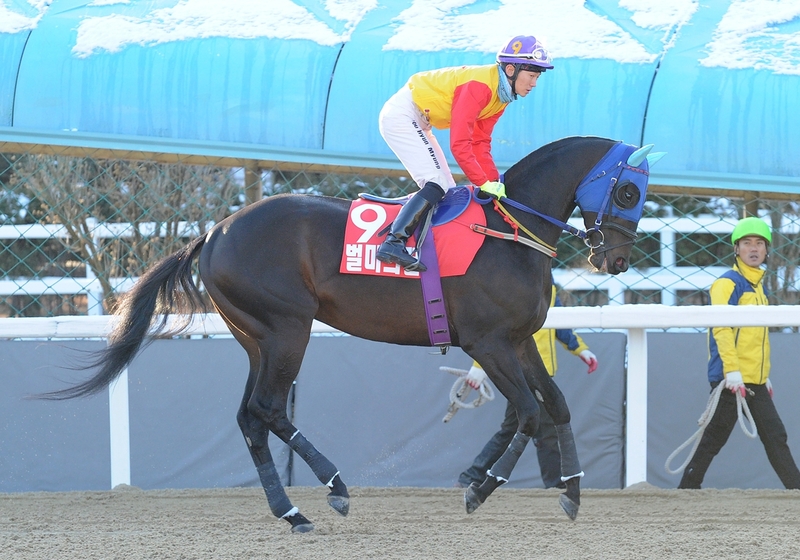 NEW YORK BLUE (USA) [Candy Ride – Aim For The Moon (Deputy Minister)] (11/5/4/0) 3-year-old filly – She was second in her first Stakes race, the KNN Cup, at Busan in June and followed it up with a dominant three-length win last month against strong opposition. A likely front-runner, she could be very dangerous on her Seoul Racecourse debut. INDIAN BLUE (USA) [Henny Hughes – Gambler’s Passion (Prospector’s Gamble)] (18/5/4/4) 4-year-old filly – Firmly as one of Seoul’s top horses at any distance, her win record doesn’t reflect her true ability. She was 2nd in last year’s KRA Cup Classic and 4th in the Grand Prix Stakes. She beat Watts Village earlier this year and, while she may not be able to win this, she could be close. 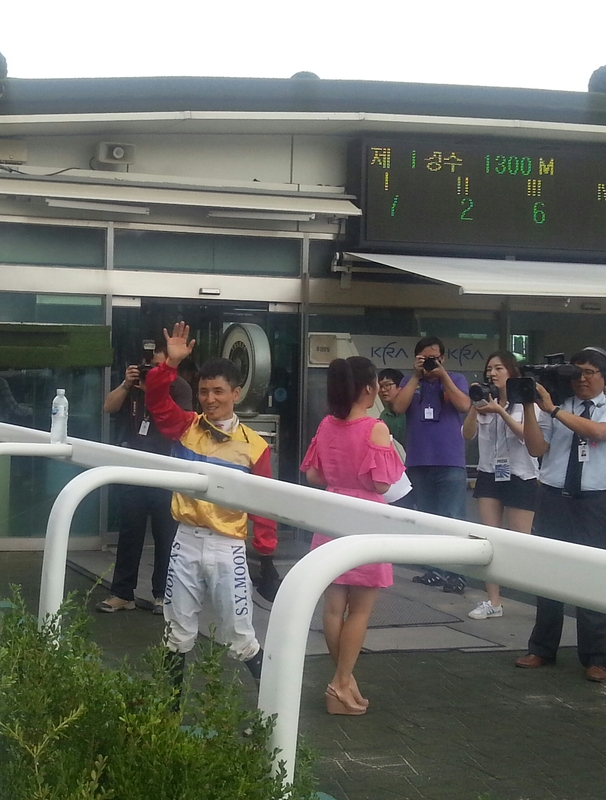 Moon Se Young today went where only one Korean man has ever gone before and rode his 1000th winner. A four-timer last Sunday had taken him to the brink and while he couldn’t quite close it out in the rain last week, it didn’t take him very long today. Riding Cheonha Miin in race 1, a horse who under any other jockey would probably have been 2nd or 3rd favourite but under Moon was odds-on, he settled just off the pace, before finding the rail in the home straight and guiding his filly to a comfortable win. 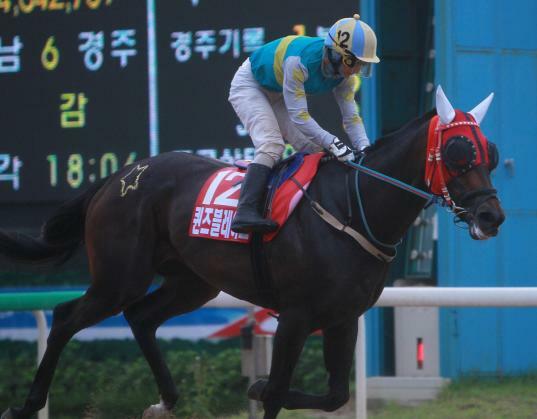 There was no overt celebration; a brief handshake with 2nd placed jockey Choi Won Joon as they pulled up was the only sign that this was anything other than another routine victory. Indeed back in the winner’s circle, Moon tried to play it down, however, the presence of a KRA broadcast team and a large number of well-wishing punters scuppered that idea. After a brief interview, Moon was ambushed by the several female members of the jockey colony who, just like those punters who had gathered, were determined not to let such an occasion pass without due recognition. 1,000 winners may not sound like a lot, especially for a 33-year-old. However, Korea is a little different. Moon Se Young qualified in 2001, in an age when jockeys were restricted to just 5 rides a week. Not a day, a week. Even when that restriction was lifted – and after Moon had served his time in the military – he could (and still can) only race 2 days a week; an absolute maximum of 20 rides. Yet in that time, Moon Se Young has won everything. Among almost every big Stakes race, his most memorable victories came in the 2007 Grand Prix Stakes on Bally Brae in 2007 and then in a string of big races, including the Korean Derby in 2012, on the remarkable Jigeum I Sungan. Only “President” Park Tae Jong has won more races than Moon. Park, 15 years Moon’s senior, is currently out injured but is approaching 2,000 winners. He is probably the only jockey who is a household name in Korea. Moon Se Young, one of Korea’s great sportsmen, must soon be approaching that status. He finished the day on 1,002 winners. 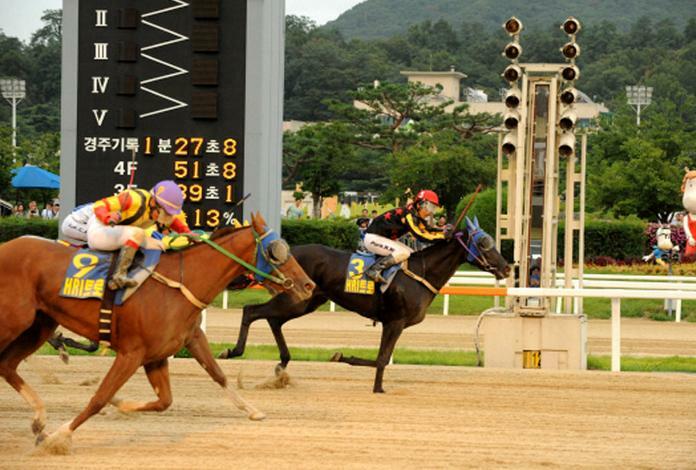 With Seoul having taken its annual summer vacation this past weekend, all eyes were on Busan as the only venue for thoroughbred racing on the peninsula. And for Beolmaui Kkum, it was a welcome return to form after a long absence. Touted as a potential star at the end of last season having won 7 of his 10 starts, Beolmaui Kkum (Put It Back) led the way in the Grand Prix Stakes at Seoul in December before fading in the home straight to end up near the back. This would be repeated on two starts at the beginning of this year before he was given close to six months off. Returning to the track in Saturday’s feature race, punters clearly hadn’t forgotton about him, sending him off as 3rd favourite in the 1900M class 1 handicap. As he tends to do, Beolmaui Kkum went straight to the front but this time had plenty left when jockey Lee Hee Cheon asked him for an effort in the home straight and he cruised away from his rivals to record a 5-length victory. Beolmaui Kkum’s return to form was welcome in what had been looking a rather stale group of class 1 horses at both Seoul and Busan. Over the weekend, however, enough up-and-coming imports put in solid enough performances to suggest that we have plenty to look forward to over the coming months. On Saturday, there were two such stand-out performances. 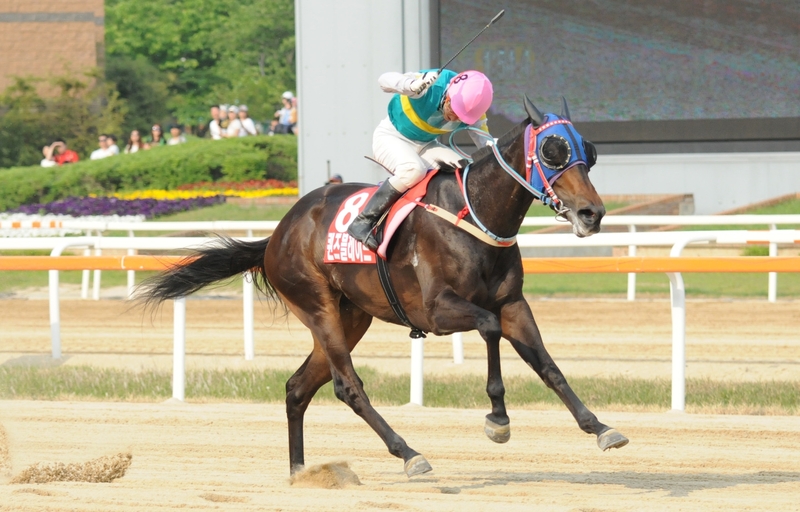 First, Australian colt Gumpo Daeseung (Shaft) made it 4 wins from 5 starts in a class 2 race over 1400M. He had to work for it though. Late to the gate after being re-shoed, Gumpo Daeseung was tracked all the way to the line by 2nd-favourite Uregachi, just holding on to win by a nose. At a lower class, there was far less stress for US gelding Spring Gnarly (Master Command), who was guided to a 3-length win by apprentice rider Chae Sang Hyun and now moves onto 3 wins from 5 starts. Sunday’s marathon 15-race card saw another import put in an impressive performance as Mujinjang (Silver Train) strolled to his 6th win in 7 career starts, claiming the class 2 race 14 by two lengths. On the domestic fron there were encouraging performances too. Derby also-ran Gumpo Sky (Vicar) offered further proof that his disappoiting run in the Classic at Seoul was an aberration, by strolling to a 7-length victory in Saturday’s class 2 race 6. One race earlier, Peter Wolsley’s Never Seen Before (Ecton Park), who didn’t even make it to the Derby, was similarly impressive in deconstructing a similar class 2 field by the same 7-length margin. Both are now likely to be pointed towards the final leg of the Triple Crown, the Minister’s Cup at Seoul in October. Next week, action returns to Seoul and it is International Exchange race weekend. Although there is no International Jockey Challenge this year (due to the Asia Challenge Cup being run later in the month which will include 6 visiting jockeys), there will still be plenty to look forward to. Full previews up soon.